Famously subtitled “A Trivial Comedy For Serious People,” Earnest‘s plot revolves around two pairs of lovers. Jack (Nicholas Koy), is called ‘Jack’ in town, but ‘Ernest’ in the country, with Ernest being a secret identity he concocts in order to carry out his ideal bachelor lifestyle without any real consequences. Things get dicey when his fiancée, Gwendolen (Kathryn Geertsema), insists that she will only marry a man named Ernest–her life-long wish. Further complicating the plot is Jack’s roguish friend Algernon (Sean Jacklin), who decides to visit the country under the name Ernest, and ends up falling for Jack’s ward, Cecily (Laura Meadows). What follows is a farcical tangle of mistaken identities and misnamed suitors, with plenty of double-talk, rapidly shifting alliances, and absurdist wit. As usual, you really can’t go wrong with Wilde’s script. His writing is snappy and silly, brilliantly funny in the same moment as he is cutting. Everything is trivial to the point of brilliant, bubbling, effervescent nonsense. But with such a fabulously funny script, the success of each new Ernest adaptation depends largely on the charisma and chemistry of the four lovers. Happy, the Alumnae have a strong cast on offer here, and their individual characterizations all play intriguingly against one another. Koy as Jack leads the pack, with a rabbity energy that carries him through a good showing of physical comedy. This Jack’s thoughts are frequently one step ahead of whatever his body is doing, which gets a lot of strong laughs. He feels as though he’s embracing the ‘farcical’ side of the play’s ‘farcical comedy’ label the most. Jacklin’s Algernon, meanwhile, has a dry and wry languidness that pairs well against Koy’s more neurotic characterization. The two are tremendous fun together, and Jacklin plays Algie with infectious relish for the material (and Algernon does tend to get some of the best lines). He balances irony and sincerity nicely: you buy him as both the scoundrel and the repentant, lovesick fool. Another element of this production that I really enjoyed was just how obviously repressed the lovers are. At one point, Algie tells Jack that “the way you flirt with Gwendolen is perfectly disgraceful. It is almost as bad as the way Gwendolen flirts with you”–and this production plays this up as much as they can get away with. Koy’s awkwardness and Geertsema’s straightforward fervor makes for a lot of really, really funny background glances or asides between them. You feel like they’re really bursting to get to one another, which is made doubly funny by Geertsema’s gravitas (which I thought might even have been played up further). Her Gwendolen feels both simultaneously like Lady Bracknell’s daughter and a fiercely independent go-getter. Meadows as Cecily is also wonderfully winning, with a shrugging, hair-tossing charm that brings out the character’s confidence and ability to hold her own in a battle of wits (even if it is buried under a girlish veneer). She rounds out the central foursome, and has some of the funniest background reactions of them all. Though it all hangs well together, there isn’t really anything about Barbara Larose’s adaptation in particular that doesn’t err on the side of conventional–or, at least, a little cozy and familiar. This isn’t a bad thing—if it ain’t broke, don’t fix it—but all this means is that there really aren’t any standout elements that set it apart from other Earnest adaptations that have filtered in and out over the years. There is the genderswitched casting of Lisa Lenihan as Lane, but this in and of itself doesn’t change the texture of the play overmuch. 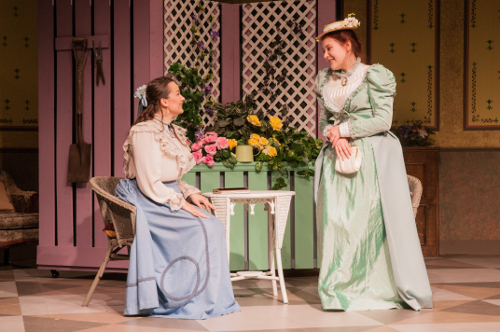 All in all, though, Larose’s Earnest is a thoroughly enjoyable production that delivers on the laughs and the rapid-fire wit that any good Wilde play should do. While it’s a familiar one, this means that what you get is a strong traditional adaptation of the play. As such, I think this would be an excellent introduction to Wilde for any newcomers, and old hats will find plenty to enjoy as well. The Importance of Being Earnest is playing at the Alumnae Theatre until October 6, 2018. Designer Panel Pre-Show (with snacks) on Thursday, September 27, 2018 at 6:30pm, with performance at 8 pm. Sunday Matinee Post-Show Talkbacks on September 23 & September 30, 2018. Tickets are 25 dollars most nights, with 15-dollar Wednesdays. Tickets are available online or at the box office. Photo of Laura Meadows (Cecily) and Kathryn Geertsema (Gwendolen) provided by the company. Previous PostReview: No Time To Kill (Mysteriously Yours)Next PostPlaylistings in Toronto for the Week of September 24th, 2018.